"Traditional Russian beet salad that is super delicious, cheap and easy. A personal favorite. I like to add black beans and chickpeas to increase the protein content and make it savory." Place the beets and potato into a large saucepan, cover with water, and bring to a boil. Reduce heat to medium-low, and gently boil until the vegetables are tender, 30 to 45 minutes. Drain the beets and potato, and let cool completely. Remove peels when cool; cut into 1/4-inch dice. Place a steamer insert into a saucepan, and fill with water to just below the bottom of the steamer. Cover, and bring the water to a boil over high heat. Add the carrots, recover, and steam until just tender, about 5 minutes depending on thickness. Remove from steamer, and let cool completely. Dice when cool. Place the beets, potato, carrots, red onion, pickles, marinated mushrooms, garbanzo beans, black beans, corn, green peas, and green onions into a large salad bowl, and gently stir to combine. 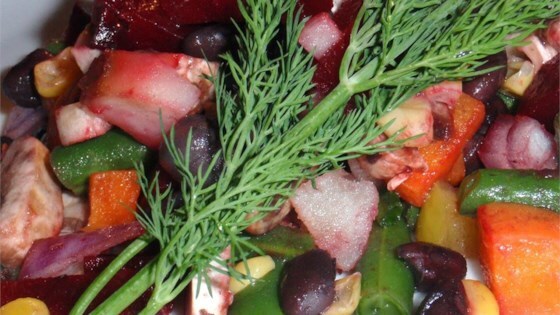 Drizzle in the vegetable oil, stir again, and garnish the salad with the fresh dill to serve. The pickles added quite a contrast to the vegetables. It s a very colorful salad. The dill sprig makes a delightful garnish! I'll be making this again.